The petrol-automatic is available in the top-spec Limited variant only. This means, it gets all the bells-and-whistles including projector headlamps, LED tail lamps, and 17-inch alloy wheels. Speaking of which, the alloys are borrowed from the mid-spec Longitude variant but get a satin finish. It’s a similar story on the inside - there’s quite a bit of kit including the 7.0-inch touchscreen with Android Auto and Apple CarPlay, dual-zone climate control, and grey leather upholstery. That said, it does miss out on a few features that should’ve been bundled in at this price point. The feel-good features such as auto headlamps and wipers, an auto-dimming rearview mirror, electric seats, cruise control and how can we forget - the sunroof - are missing from the Compass. Also, side and curtain airbags are reserved for the 4x4 variants - so you get just two airbags. Finally, since there’s no drive mode selector - you get a useful cubby hole in front of the gear lever. But, the rock-solid build quality is thankfully standard. The doors shut with a reassuring thud, the soft-touch plastic on top of the dash feels wow, and the leather used on the seat - although easy to soil - is of a really good variety. Before we sign this section off, can we all agree that the blank buttons on the steering are an eyesore? Yes? ONWARDS! The petrol Compass is powered by a 1.4-litre engine that makes 163PS of power and 250Nm of torque. That’s 10PS and a full 100Nm lower than the diesel. Does that mean it’s a bit boring? Well, not really. If you drive with a light foot; you shouldn't have any complaints. But this turbo petrol isn't as punchy as the diesel in the way it drives. This engine builds speed in a relaxed and steady manner. The turbo kicks in at around 2000rpm; but it isn't going to give you a strong surge of torque and pin you to the seat. Acceleration is brisk, just not exciting - unless you’re really giving it a lot of stick. In terms of refinement, it isn't as smooth or quiet as other turbo petrols we've driven; it's a bit clattery and noisy. And move towards the higher end of the rev band, the motor becomes more and more audible inside the cabin. But, there’s one big, and we mean BIG elephant in the room. To call the Compass thirsty, will be a bit of an understatement. On test, we managed 6.18kmpl, inside the city. The figure was a notch better, at 8.58kmpl of the highway. In fact, the highway feels like the natural home of the Compass automatic. The engine is happy to tag along for a fast cruise. And it’s on these fast cruises that the gearbox complements the engine beautifully. But, inside the city - it’s a bit confused. 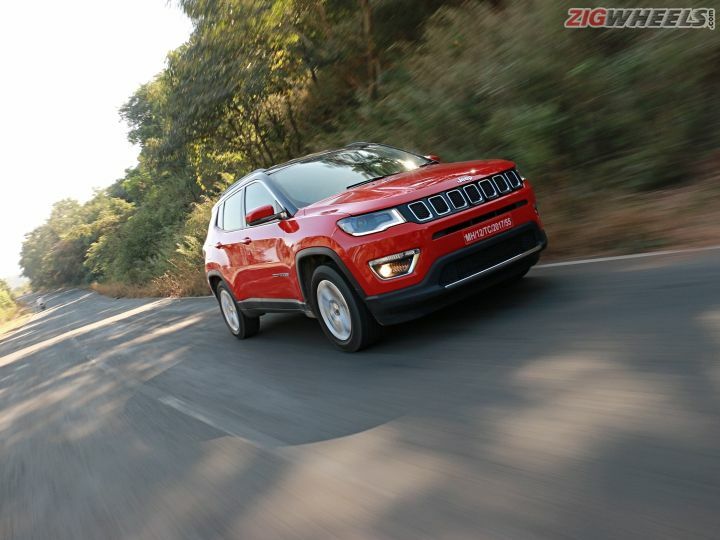 Now, you expect automatics, especially dual-clutch units like the one in the Jeep to be buttery smooth. But, this one isn’t as slick-shifting as say the Volkswagen DSG. It takes a while, hesitates a bit before it actually selects a gear. And, in this confusion, it ends up keeping the motor on the boil by sticking to the lower gear. You don't get paddle shifters, and even when you shift using the gear lever - it will obey your commands only if it thinks it should. For most other times; you get a warning on the MID that says shift not allowed. It also takes a while to respond to part-throttle. So, for that quick overtake - you will have to do some planning ahead of time. That said, if you want nothing more than convenience, it does deliver. Driving it around gingerly masks most of the shortcomings, and if that’s your driving style - you shouldn’t have an issue with it for everyday use. Much like the diesel, the petrol-automatic Compass delivers in spades when it comes to demolishing broken roads. In fact, the faster you go over them, the lesser you’d feel inside the cabin. At low speeds, the stiff ride can get a little bouncy. But, as the speed climbs, the Compass’ cabin settles down to its cushy best. And, dare we say - it’s quite fun around the ghats as well. The steering is weighty and precise; and the body roll is quite well controlled too. There’s a bit of kickback from the steering when you push it really hard; but for a calm drive around the twisties - it does just fine. We had no issues with the brakes, but the ABS seemed to kick in a bit too early under hard braking. The Compass also gets a host of other safety features, including traction control, electronic stability control and hill assist. The parking brake is electric, that engages and disengages automatically when you shift to Drive or Park. Do remember that the switch works even when the car is in motion; that brakes the car abruptly. So, yeah - careful! So, is the Compass petrol auto the city slicker it's meant to be? Not quite. The gearbox could've been a bit more polished and the small engine seems to struggle a bit lugging around the big Compass. If we were to choose right now, we'd still pick the manual diesel. If you’ve got your heart set on the petrol-auto; you will have to adapt to its ways and drive with a light foot. Not only because it’s thirsty, but also a lot more relaxed to drive, when you are.